Use dried flowers to add an interesting, dimensional element to a floral picture frame. 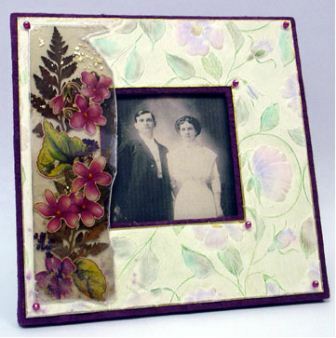 Paired with flower stickers and colorful mica pigment, this frame is unique and colorful. Emboss the paper using the stencil and the Folia™ Cardstock. With a relatively dry brush, paint the raised areas with the MicaColor™ watercolor palette. When dry, use Great Tape™ and adhere the embossed paper to the frame. Apply the Mica Flakes™ & dried flowers to the inside of a Mica Tile™, adhering them into place using the Perfect Paper Adhesive™-Gloss. Apply the stickers and reassemble the Mica Tile™, then adhere it to the picture frame. Adhere the Mica Tile™ to the frame.